NHS England has announced £130 million in funding to update or replace more than 100 radiotherapy machines that have past their sell-by date in England's hospitals. Figures released in February showed that out-of-date scanners are commonplace across England's hospitals. Experts recommend that radiotherapy machines as well as MRI and CT scanners should be scrapped after 10 years. In 111 of England's hospital trusts, 63% have at least one scanner or treatment machine which is a minimum of a decade old, according to figures obtained by Sky News. 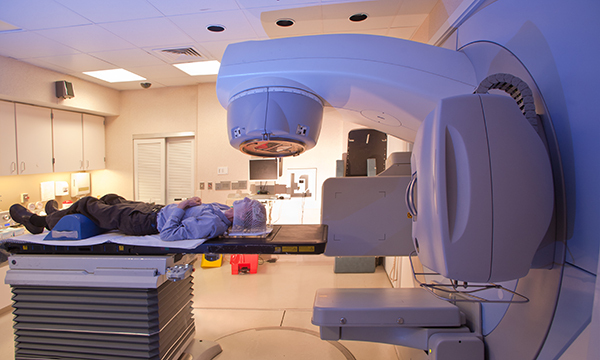 One in five (21%) linear accelerator (Linac) radiotherapy machines at the trusts were at least a decade old. NHS England chief executive Simon Stevens said: 'Up to half of NHS cancer patients who are cured benefit from radiotherapy. About four in ten NHS cancer patients are treated with radiotherapy, which typically uses high-energy radiation from a Linac machine. Over the next 2 years older Linac radiotherapy equipment being used by hospitals across the country will be upgraded or replaced, Mr Stevens said. Cancer Research UK said the investment would 'change the face of cancer treatment' in England, but also called for severe staff shortages across cancer services to be tackled. A report by the Independent Cancer Taskforce published in 2015 called on the NHS to create a replacement plan for radiotherapy machines as they reach 10 years of age. Cancer Research UK chief executive Sir Harpal Kumar said: 'Outdated radiotherapy machines in many parts of the country have meant that patients have been denied a treatment that gives them the best chance of survival as well as reducing debilitating side effects. NHS England will also set out the progress it has made on other elements of the national cancer strategy set out by the independent taskforce at its annual general meeting. The organisation has taken a series of steps to act on recommendations set out by the taskforce, aiming to give patients in England world-class cancer care. Sir Harpal, who was independent chairman of the Cancer Strategy Taskforce, said: 'Good progress has been made since the NHS cancer strategy was published last year. 'But it will be critical over the next 12 months to start tackling the severe staff shortages in key cancer services if we are to see real advances in areas such as earlier diagnosis.